WTF Vice President Park Sun-Jae (left) poses with winners of the men's title at the 10th WTF World Junior Taekwondo Championships in Taipei City, Chinese Taipei on March 26, 2014. 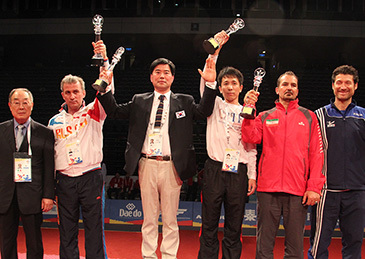 South Korea took both the men's and women's overall titles at the 10th WTF World Junior Taekwondo Championships in Taipei City, Chinese Taipei, which concluded its four-day competition on March 26, 2014. In the junior male division, Korea won two gold medals, one silver and two bronze medals for a total of 63 points for top honors in the medal tally. Russia earned a total of 54 points with one gold, two silvers and one bronze, followed by host Chinese Taipei for 44 points with one gold and one bronze. Iran stood at fourth as it grabbed one gold, one silver and one bronze for a total of 42 points, while Italy scored 41 points with one gold, one silver and two bronzes. In the junior female category, Korea scored a total of 49 points to defend its title with one gold, two silvers and two bronzes. Iran came next with 42 points for one gold, one silver and two bronzes. The Great Britain came next with two golds and two bronzes for a total of 41 points. China followed with one gold and one bronze for a total of 36 points, while Germany ranked fifth with two silvers for 36 points. The four-day biennial championships, which took place at the Taipei Arena in downtown Taipei City, attracted a total of 793 athletes and 472 officials from a record 107 countries. A total of 90 international referees officiated at the championships. The best male athlete honors of the championships went to host Chinese Taipei's Chen Yu Wang, the gold medalist in the junior male -48kg division, while Croatia's Matea Jelic, the gold winner in the junior female -63kg division, was chosen as the female MVP. The Best Referee Awards of the championships went to Ms. Emmanuella Ane of Cote d'Ivoire, Chinese Taipei's Ms. Shu Hua Dai, Switzerland's Walid Younes, New Caledonia's Coleux Thierry, and the United States' Seung Hwan Kim. Korea's Won-ho Lee was chosen as the Best Coach in the men's division, and Croatia's Lidija Katalinic Spolaric was selected as the Best Coach in the women's category. The Good Fighting Spirit Award went to Libya and the Participation Award went to Mozambique. The final-day competition, which took place at the Taipei Arena in downtown Taipei City, featured four weight categories: the junior female 46kg, the junior female -55kg, the junior male -59kg, and the junior male -63kg. In the junior female -46kg weight division, Russia's Victoria Khan came from behind to beat Thailand's Napaporn Charanawat 3-2 in the final match to earn her country the gold medal. The bronze went to Iran's Nahid Kiyanichandeh and Spain's Tamara Miquel in the category. In the junior female -55kg weight category, Croatia's Ivana Babic came from behind to defeat Korea's Geum-byeol Lim 11-4 for the gold medal. Iran's Mahsa Jeddi and Turkey's Fatma Saridogan won their respective countries the bronze medal in the same division. In the junior male -59kg weight category, Korea's Seok-bae Kim defeated Thailand's Nutthawee Klompong 7-1 in the final match for the gold medal. In the same division, the bronze was shared by Iran's Reza Jafarpourzarrin Kolaei and Poland's Albert Millert. In the junior male -63kg division, Brazil's Edival Pontes needed a fourth, golden-point round to earn his country the gold medal as he came from behind to tie the score 9-9 against Russia's Soso Kvartskhava in the final seconds of the third round. Turkey's Hakan Kavurat and Italy's Simone Crescenzi shared the bronze medal in the same category.